These wonderful “Fidget Mats” are in high demand. I made some and took them to the local Nursing Homes and the patients are loving them! I sent a community email out to announce that I have them available and was inundated with requests for the mats for their loved ones. Who knew we had such a need for an “Activity mat for dementia patients”? They are also great for Alzheimer’s, Stroke and Heart Attack Patients. NBC5 and the Hood County News have been out to see me. Both doing wonderful Press Releases. 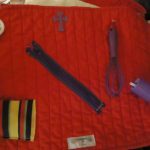 The objects on my mats are durable, with no sharp edges, and they have soft fabric to touch. 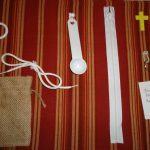 Each mat has a zipper, snaps or buttons to give hand-eye coordination, and a Cross to help remind them of their faith. I attach custom labels so the caregivers can easily contact me for more. Feel free to copy my idea and share them in your community. I do not charge for these mats. They are my contribution to local patients with dementia. Li Cross – Granbury, Texas. I urge people to copy my idea and make these mats for your local community. We appreciate donations of materials and we accept monetary donations for the purchase of supplies. I encourage you to copy my ideas and make these mats for dementia patients. There is a great need for them and it’s not about making money, it’s about changing lives. I never charge for these mats. 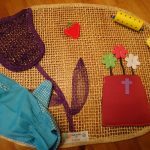 Use plain colored cloth placemats. Busy prints can be confusing. Select mats thin enough to sew through. 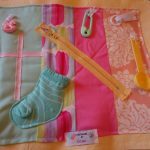 Use a sewing machine for everything you attach. 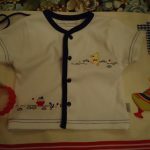 (Buttons can be hand sewn). Tacking by hand may not be strong enough for continuous pulling and tugging. 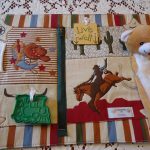 Zippers, Keychains, Tiny Socks, Patches, Buttons, Small Cloth Dolls and Baby Shirts work well on these mats. Flat Cloth “Shoe laces” make great cording for attaching items. Attach a “Cross” to each mat to remind them of their faith. Don’t put “keys” on the mats….it makes them want to go home. Be careful not to use anything that may break and injure the patient. 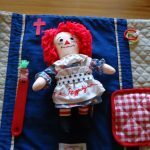 You can take fabric and make a “pocket” to sew on the mat and place a keychain in the pocket for fun. Be sure to attach the keychain so it doesn’t get lost. 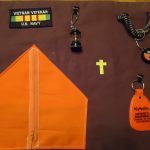 You can also make a tent from fabric and sew the zipper on top of the tent to appear to open the tent. Zipper will work freely too.